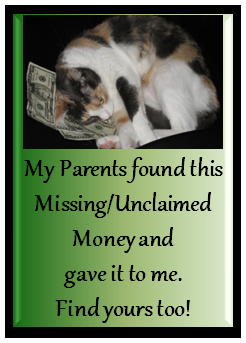 I’ve helped you save money, now let’s see if I can help to find you some Missing Money or Unclaimed Property. Some of us or our relatives have money due us that we don’t even know about. To help you find out if you or your close relatives might be due money, I’ve compiled a listing of sources to easily search online under your or their names. And (not to be morbid), don’t just search under the names of living relatives, because very often you will find that a deceased relative has money due them, or they left an Insurance Policy that no-one ever knew about! Search in every State that they resided in and under every married last name they had, as you should for yourself. If you or they changed your name search under that name as well. I found a Life Insurance Policy for a deceased relative for someone else by doing this very thing, and found my Grandmother-in-law some funds. Nothing for myself (darn it). But be thorough! Free of charge – Government Search: If you ever had an FHA-insured mortgage, check this database. Free of charge – If you ever had funds in a financial institution (bank or savings and loan) that failed/closed, and you believe that you may be due money, check this database. Free of charge - Government Search: Check for Savings Bonds that were never redeemed. You will have to enter your Social Security number. Do you have a tax refund that you haven't collected on? Even if you're not sure, you should check. If you moved and didn't give the IRS a forwarding address after filing, or some of circumstance that could cause them to hold your refund, you certainly want to know. Here's the deal, if the IRS is holding your refund money and you don't claim it within 3 years from the time your refund was due, they can keep your money.